"The Portuguese are anti-Spanish racists! 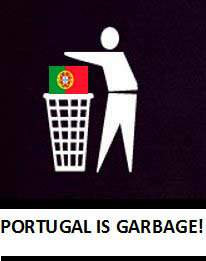 Say NO to Portuguese everywhere on the planet! DON'T do business with them in any way, shape, or form! Portugal e uma merda!" Ruben Teixeira (2017). "I Highly suggest that all those who are the victims of Portuguese constant Racial slurs unite and Veto these pathetic and multi-generational backward people (Sometimes also referred to as follows within a Global Context: Bacaladitos, Lusos, Portugee, Poortugee, Portoputas, Portugypsies, Azorians, etc.). A good start would be boycotting their wines, businesses, stores, soccer teams, and the ethnic group itself. Challenge them, Educate them - if you can because talking to a Portuguese is like talking to a Brick Wall - in order to Make them understand that this form of Racist behavior is NOT acceptable nor tolerated in today's society." Dr. Fuzeta (2015). Today Portuguese are Fleeing Portugal to former Third World Colonies to live a better life! **BRITISH DON'T WANT ALLIANCES WITH PORTUGAL ANYMORE! ***LEGAL DISCLAIMER: The information presented herein is based on compiled third party facts within the World Wide Web. They do not represent the ideas, writings or opinions of the Webmaster, or blog holder, etc. Thus, we are not liable for any damages incurred whatsoever before, during, or after reading said materials. 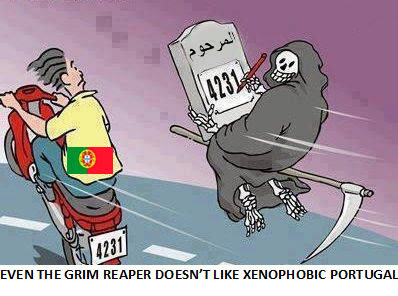 Do NOT shoot the Messenger, and READ INFORMATION AT YOUR OWN RISK since this is HOW Portugal is viewed by others on Earth who are also entitled to their own opinions like you are.